Sessions Payroll is an established Hollywood payroll service and the leading movie extra payroll service in Hollywood. Payroll volume runs at approximately 10,000 checks per week for movie extras working all over the united states, for a number of large production companies and movie studio’s. Each production company has its own needs in terms of pay rules and up to the minute reporting they require. Also, each state has different tax structures, so Sessions needed a system which could accommodate the volume while also cutting down on human error. Payroll data can be entered directly via the web, with invoices generated automatically, lowering costs while paying people faster. With large customers like HBO and over 45,000 extra’s paid, this solution enabled Sessions to become a leading movie extra payroll service. Payroll is entered via an easy-to-use time-clock entry system, and production companies are able to track costs real-time via the web. Great plains is Microsoft’s ERP Business Software and is fully integrated here with a highly customized web interface. transaction batches are inserted for tax calulation, check printing, and General Ledger updates. The system features a secured web interface which enables users to browse Employee pay History, enter Vouchers using the timeclock feature which generates pay lines, and also run production reports. The system utilizes SQL Reporting Services to generate reports and make them available via the web. Output includes sophisticated drill-down features which enable production companies to track costs online. 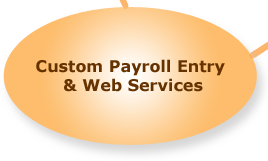 "Framework Solutions developed custom payroll software which has enabled us to grow rapidly." Some years ago, my company began to grow at an alarming rate. We found that we needed new software to keep up with the increasing demands from our clients. We turned to Framework Solutions and through their efforts in helping us to design and implement scalable custom software that integrates with Microsoft Dynamics GP, our operational costs were reduced, we became more efficient, and we were able to keep up with continuing growth. Consequently, we pulled ahead of our competition in Movie payroll Services. For those companies who are in similar need of effective software solutions, I highly recommend Framework Solutions.